The latest five-year graduation rate is 77.5 percent, up 4 percentage points over last year, CPS said. CHICAGO — The number of students graduating from the Chicago Public Schools within five years rose another four percentage points in 2017, hitting an all-time high, district officials said Monday. CPS officials called that increase "blistering." "From growing graduation rates to shrinking achievement gaps, Chicago’s investments in education are ensuring our children can live up to their promise and potential," Mayor Rahm Emanuel said in a statement. In all, 20,525 students — or 77.5 percent of students who started high school since 2012 — earned a high school diploma in 2017, according to data released Monday by CPS officials. Over the last six years, the five-year graduation rate rose 36 percent, according to CPS officials, as students prepared to head back to class Tuesday. In 2017, 18.6 percent of students dropped out, continuing a steady drop from 2011, when 39.8 percent of students failed to graduate within five years of their first year of high school. 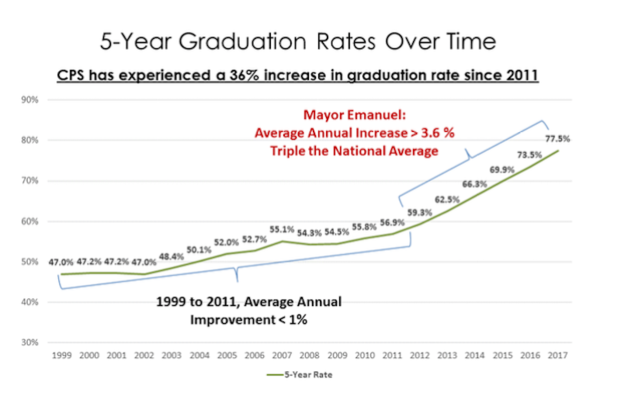 Since taking office in 2011, Emanuel has made improving the city's schools a focus of his administration. The mayor routinely touts rising test scores as evidence that his initiatives are working. After state lawmakers reached an agreement to change the way the state funds schools Aug. 24, Emanuel said when he took office the school's "academic books ... were not right." "Chicago Public Schools, academically, are in a different place" today thanks to the "hard work of our teachers, principals and parents and leaders in the Chicago Public Schools system," Emanuel said. 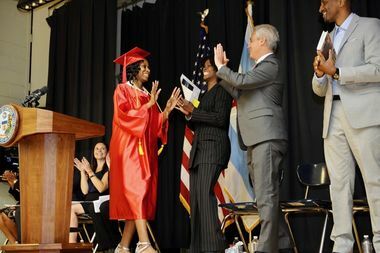 Chicago's rising graduation rate mirrors a nationwide trend, but the number of Chicago students who graduate within five years still is below the national average, which is 83.2 percent, according to a national report card compiled by Grad Nation. That is also an all-time high, according to the study. However, the CPS graduation rate is rising at triple the rate that the national average is growing, CPS officials said. "These improvements have occurred at an unprecedented pace, signaling a major culture shift that’s focused on supporting students and preparing them for success in high school and beyond," public schools CEO Forrest Claypool said in a statement. The graduation rate for African-American students continued to lag behind the districtwide graduation rate, but those students recorded a greater jump than all students, officials said. In 2017, about 63 percent of African-American students earned a high school diploma within five years, an increase of 5.4 percentage points from 2016. About 81 percent of Hispanic students graduated from high school within five years, officials said. That is an increase of 3.2 percentage points from 2016. Female students had a graduation rate of nearly 84 percent in the last school year, up about 3 percentage points from 2016. Male students had a graduation rate of 71 percent, up 5 percentage points compared to the previous year. In October 2015, CPS officials admitted graduation rates between 2011 and 2014 were lower than CPS originally advertised because officials did not count out-of-system transfers and those who took an exam to earn their degree as dropouts, although state law requires them to be counted that way. The data released Monday accurately counts students who transferred out of the system or are studying to earn a high school equivalency credential, CPS officials said.